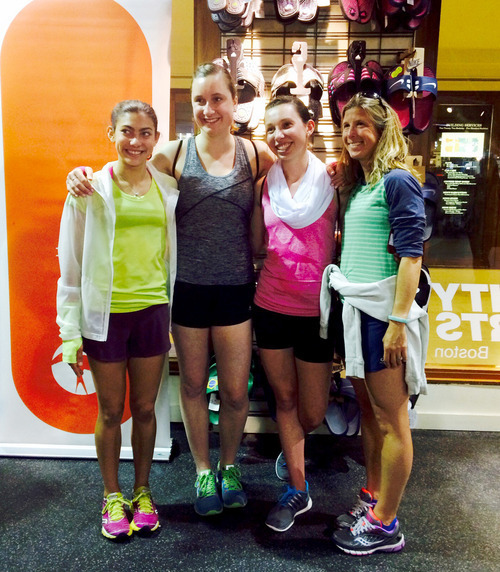 A few of us met up at the Oiselle fashion show at City Sports Boston last night! Honestly, I kinda thought this would be a huge event. I even posted a photo of my outfit – race-style! – so that friends would be able to find me. But it was still a wonderful little gathering of about 20 women, and four runway “models” from the Lexington High School track team. Awesome meeting online friend Rebecca of Running With Music! She coaches more than 60 girls on the Lexington team! What’s coolest is that City Sports is now carrying Oiselle gear right there in the store! So if you’ve been wanting to touch those beautiful fabrics and see how they fit, swing by! Above friends: Hannah, Lindsay, Sarah, Sarah and me! Oh wait, I lied. What was coolest were the Rice Krispy treats that Oiselle sales rep, Anne, made for the gathering! Fabulous!!!! 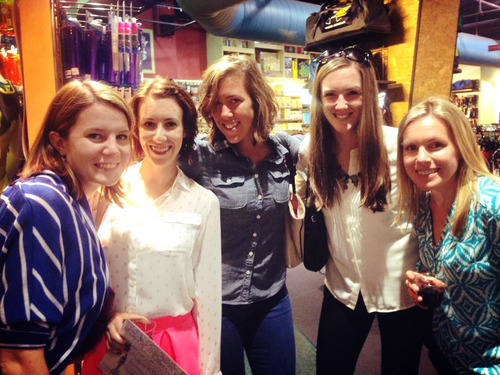 Great evening – thank you ladies!! ← Back to Run Club!